Massachusetts has a number of romantic destinations for couples, whether they are looking for a simple weekend getaway in the city, vacationing along the ocean or honeymooning in the mountains. With so many options for accommodation, dining and fun things to do, you will likely find something to meet your desires and needs in Massachusetts. Stroll along the cobblestone streets of Beacon Hill, one of Boston's most historic neighborhoods. 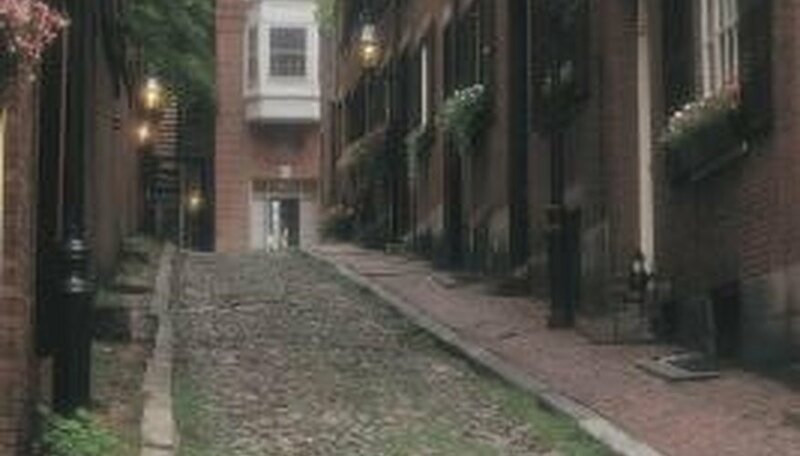 Situated in Boston, Beacon Hill provides couples with a taste of life during the 19th century with its narrow, cobblestone streets and historic buildings. Couples can enjoy romantic activities, including picnicking on the Boston Common, a visit to the Franklin Park Zoo and touring historic sites, such as the nation's first public school, Bunker Hill Monument and Copp's Hill Burying Ground. Couples may also enjoy the area's variety of night clubs and dining options. Located five miles off the southern coast of Massachusetts, Cape Cod provides an ideal destination for couples seeking romance. Many public beaches surround the island, giving couples the opportunity to engage in a number of water activities, such as swimming and boating. Couples may enjoy a trip to the towns of Chilmark and Aquinnah to take in the amazing scenery, which consists of stone walls, rolling hills and ocean views. Other romantic island activities include the Polly Hill Arboretum, Mytoi Garden and Colonial Edgartown. The Berkshire Mountains, also referred to as the Berkshire Hills or simple the Berkshires, run through a portion of western Massachusetts and provide spectacular views and opportunities for romance. Romantic activities within the mountain region include taking in places like the Berkshire Botanical Gardens, Chocolate Springs Café and Hancock Shaker Village; relaxing at one of the area's several spas; or engaging in recreational activities like hiking, biking, skiing and golf. Couples can take a romantic cruise along the Charles River in Boston aboard one of three ships with the Charles Riverboat Co. Typical cruises last either two or three hours and include a variety of meal options. The boats are carpeted and decorated with various nautical antiques. Couples can enjoy the view from the outer decks or a staffed bar with large picture windows surrounding the inside decks. Gamble, Jacky. "Romantic Spots in Massachusetts." Dating Tips - Match.com, https://datingtips.match.com/romantic-spots-massachusetts-8389161.html. Accessed 18 April 2019.